A Burmese army’s artillery unit on Friday fired several rounds of mortar shells on KIA position at Dumbau Bum and surrounding area beginning 9 am, said a local source. Dumbau Bum is located in KIA’s 15th Battalion area in southern Kachin State. Burmese government troops then climbed up Dumbau hill where a KIA section stationed around noon and the two sides engaged in a fierce battle for about an hour. Battles continue to rage in northern Shan State between Burmese army and KIA’s ally Ta-ang National Liberation Army (TNLA). TNLA sources said there were at least two separate encounters during this week between its troops and Burmese army troops under 77th and 88th Light Infantry Divisions. A combined force of TNLA’s 527th and 717th Battalions under 2nd Brigade fought against Burmese Army troops under 77th Light Infantry Division (LID) near Pan Law village in Kyauk Me Township on Sept 25. 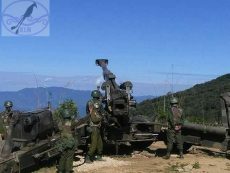 Another battle took place between TNLA’s 112nd Battalion and Burmese army troops under 88th LID near Man Tsap village in Nam Kham Township on Sept 21. Nationwide Ceasefire Coordination Team (NCCT) which represents 16 ethnic armed organizations has met Burmese government’s Union Peace-making Work Committee in a five-day meeting held at Myanmar Peace Center in Yangon on Sept. 22-26. Sporadic fighting continues in Kachin and northern Shan State despite ongoing ceasefire talks between Burmese government and representatives of ethnic armed organizations. A Maija Yang-based aid worker said low-level Burmese army soldiers are free to do anything they want in ethnic areas even as their leaders held talks with ethnic armed groups. “The attack on KIA position during peace talk show that the Burmese army is not sincere in talks with ethnic armed groups”, he said. NCCT leaders said they see some setbacks in the latest session of peace talks as Burmese government delegates changed their position in matters they had already agreed in previous talks. Lt. General Myint Soe who spoke on behalf of Burmese army said the army will stick to its six-point policy in peace talks with ethnic armed organizations. Burmese army’s six-point policy includes the points that both sides must abide by existing laws and any agreements made must be in accord with the 2008 constitution which ethnic groups want abolished and rewritten. In a statement released after the five-day meeting, the two sides said they have agreed the fourth draft of Nationwide Ceasefire Accord and had enhanced mutual trust. The two sides agreed to hold another round of talks in October. The statement also said both sides announce their willingness to expedite the final text of Nationwide Ceasefire Accord and political negotiations in order to build a long lasting peace.